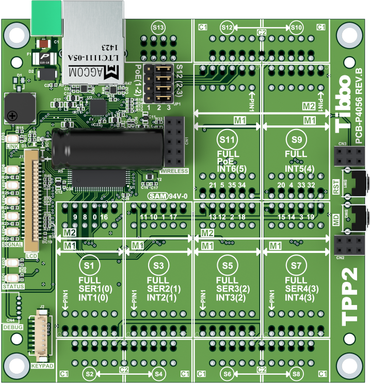 Size 2 Tibbo Project PCB (TPP2), Gen. 2 runs Tibbo OS and is programmable in Tibbo BASIC and Tibbo C.
TPP2(G2) is perfect for systems with a medium number of I/O lines. The board can optionally control a TFT display and a keypad, so it is suitable for applications requiring a human-machine interface (HMI). Featuring 3 tiles for a total of 6 "M" and 6 "C" sockets, the TPP2(G2) can implement configurations with up to four simple serial ports, up to 12 relays, or up to 24 opto-inputs, PWM, or open-collector outputs. The TPP2(G2) is perfect for data collection and AutoID projects, as well as factory, shop, data center, hotel, and home automation applications. The board contains enough "C" sockets to simultaneously accommodate temperature, humidity, pressure, ambient light, and shock sensors. With the use of appropriate Tibbits the board can even control legacy IR devices by emulating traditional IR remote controls. * The TPP2(G2) does not support the combination of 7 bits/character mode and the "none" parity mode.